Note: Entrance fees not included. This tour can be combined with other tours to be turned into a full-day tour. This Nice private tour is also offered as land day tour or shore excursions from Villefranche – Nice, Cannes, or Monaco, Antibes. Next your Nice private tour will take you to Cimiez, the winter home of Queen Victoria, making a stop at the Roman Arenas of Cemenelum. You can peruse the art at the Matisse Museum or walk among the olive garden and the 15th century garden of the Franciscan Monastery. Visit the extraordinary Russian Cathedral; built in 1912, it is the largest and most beautiful outside Russia. 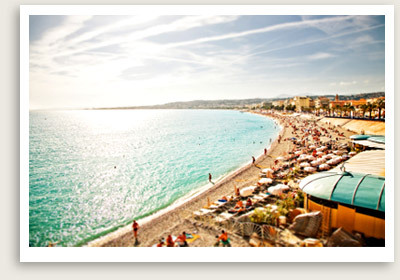 You will return by Promenade des Anglais, passing its famous landmarks and “Belle Epoque” buildings. You will end the tour with a visit to the colorful and fragrant flower market in the Old Town. Here you can try socca, a chickpea crepe that is a not-to-be-missed Niçoise specialty. You can be dropped off here to spend some more time in Old Town or driven back to your hotel.